Novana Residence. This 1 bedroom unit in on the 3rd floor with city views. Fully furnished and modern feeling throughout. Standard fitted kitchen with all electrical equipment, generous sized living & dining areas. The king sized bedroom with walk-in closet. Fitted bathroom with hot water shower plus guest toilet in living area. Air-conditioning throughout. Washing machine. 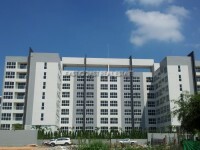 Novana Residence has been built in a central city location in the South Pattaya area. Facilities of the building are 24 hour security, communal swimming pool, Fitness, Sauna, small garden on the ground floor, underground parking and cleaning service. It is available for SALE at 2,700,000 THB in Foreign quota and 50/50 on transfer fee & taxes. Also for min. 12 month RENT at 13,000 THB/month, excluding utility bills.